Week three saw bread week challenge the contestants of Great British Bake Off to a quick-bread, baguettes and a 3D bread sculpture. Gulp. 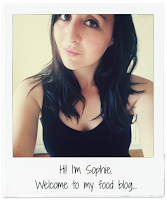 If you don’t know, I’m taking part in the #BakeOffBakeAlong with some other lovely bloggers and will be challenging myself to bake one of the three challenges each week – already having completed biscotti and Madeira cake. The plan this week was to make baguettes for the arrival of my sister, brother in law and niece but after my brother in law claimed these were ‘boring’, I quickly switched to a soda bread which we enjoyed on our picnic. 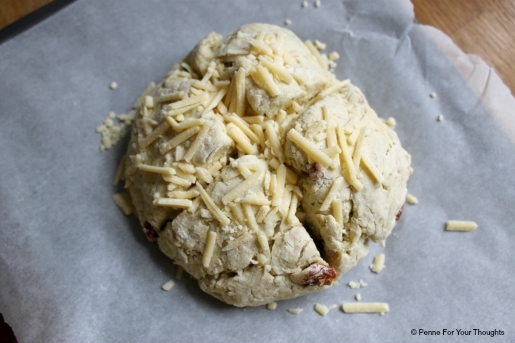 Tempted to try a sweet soda bread, I changed my mind to do a cheese, pesto and sun-dried tomato soda bread. It was a good decision. It was absolutely delicious, and the addition of pesto complimented it really well. 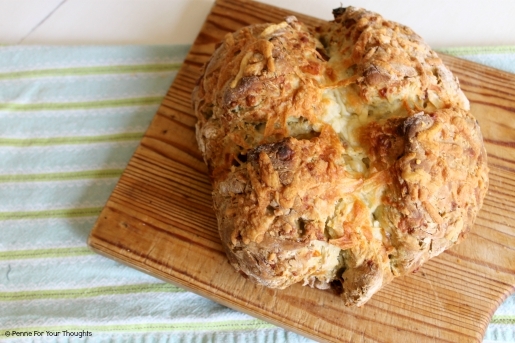 I hadn’t made soda bread before, but was surprised it was so easy. I used all white flour, instead of the traditional mix of white and wholemeal (this may or may not have been because I bought the wrong flour….) but I was happy with the results. I’d like to think it would have got the Paul Hollywood handshake. 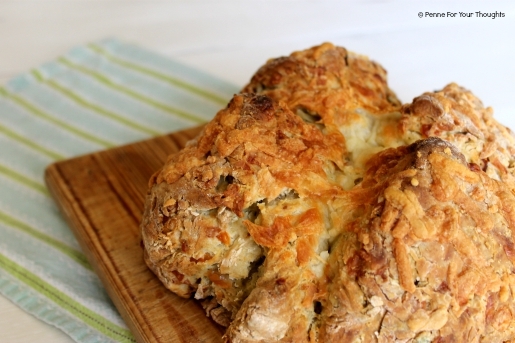 Adapted from Paul Hollywood’s recipe, featured in Bread. 2. In a large bowl mix together the flour, bicarb of soda and salt. Stir in 100g of the cheese and the sundried tomatoes. 4. Tip the dough onto a lightly floured work surface, and gently roll and bring the dough together - creating a round shape. Don't knead it. 5. Transfer to the lined baking tray then score with a sharp knife a cross in the dough, going quite far down. 6. Sprinkle the remaining cheese over the top and then leave to rest for around 10 minutes. 8. Leave to cool on a wire rack, then tuck in! WooHoo go sundried tomato crew! I have never made soda bread. This sounds really delicious and surprisingly straight forward. Must give this a try! This kind of food is good for snacks or breakfast. It looks yummier with a Sargento ingredient.Thanks for sharing your recipe. I'm gonna try this at home.